With all the note taking apps out there it is difficult to decide which one to use. There are many different apps for many different purposes, and you want to be sure you get the one that best suits your needs. 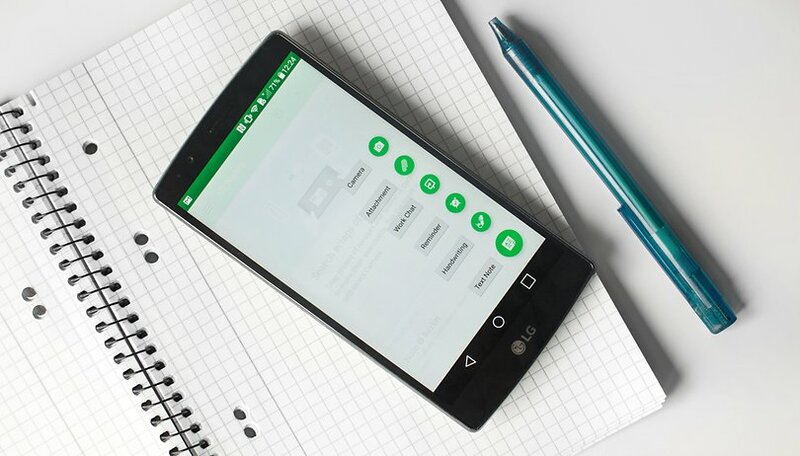 The guide below gives you the nine best note taking apps for Android. Evernote is one of the best note apps for Android because of its clean interface and multi-use functionality. Despite offering a large number of functions, it is still surprisingly easy to navigate. You can share notes with coworkers or classmates, attach notes right from the app, scan text in a photo, create to-do lists, save every type of note to one place and so much more. Other apps in its class have yet to compete with its balance of functionality and simplicity, and that has kept it at the top. Evernote was primarily for casual use but changes over the last two years have made it a great app for business. Never fear though, it is still great for personal note taking because it retains its inherent simplicity. It never feels like work when you use it to take notes outside of the office. Evernote is extremely versatile: you can make notes wherever or whenever you are, and it can sync with all your devices so you can quickly modify everything. Because of its wide-ranging functionality, it is a bit difficult to become proficient in, but it's certainly the easiest of all the big, all-encompassing note taking apps to use. Sometimes inspiration comes in unusual places, and Diaro enables you to take these thoughts and transfer them to your other devices. If you sit down at a park and suddenly come up with an idea, this app lets you write freely for however long you choose. This app is best suited to writers because it is optimal for longer notes rather than quick memos. Its writing interface is similar to what most writers are used to in a word processor and their long text can be organized and searched easily. Writers often need to transfer their notes to a larger document and this is where Diaro shines. It syncs effortlessly and works across multiple platforms. It’s password protected too, so if you write a journal or a diary, then you will have peace-of-mind knowing that someone else isn’t reading your private thoughts. Quip is a superb collaborative app, with an easy sharing function and the ability to track changes to documents. Everyone in your group can collaborate on the same document or spreadsheet from any device, anywhere. You simply create a chat room and everyone can add their notes to the discussion. Quip is ideal for organizations and there are many businesses that rely on it. Teams can create notifications to ensure tasks are completed. Your team can import documents from Google Drive, Evernote, Dropbox, etc. After you have finished collaborating, you can change the format to Word or PDF, print the notes or share them with others outside of the group. It isn’t quick to start using but most people need it for the long haul so they are willing to invest the time into learning it. If it is mandated by an organization, there could be an expert who can give tutorials and streamline the process. Squid lets you get creative with your notes. If you like to doodle, consider yourself a bit of a calligrapher or are just nostalgic for paper notes, then Squid is for you. Squid is great for students because it is very easy to add quick notes or symbols to a PDF. Handwritten notes next to keywords or definitions are excellent for studying or getting ideas for a term paper but you must upgrade your account to use this feature. It works well on a phone but is ideal for tablet use. The reasons are obvious – more space enables you to draw more and it also works great with a stylus. Color Note has fewer features than the other apps here. It has with a simple color-coded organization scheme. So, for example, you could use yellow for grocery reminders, and then simply look at your yellow list when you get to the store. If you find yourself writing a lot of notes, writing a lot in the notes, need to add pictures or videos, or need a lot of sharing functions, then you may want to pick a different app. OneNote is an older app (from 2003) originally created by Microsoft to make your lists easier to organize. It has since been expanded to include many multimedia features, such as recording video and audio. In addition to being integrated with MS Office, it is great for travelers. You can clip pictures from the internet and add them to your itineraries. This could be a map or something you saw on a museum website or a travel blog. You can then add a drawing or make a note on the side with your finger. It also has some features that outperform the much better-rated Evernote, such as more free storage space. Google Keep is one of the best organization apps for Android, it effortlessly organizes your notes and makes them searchable. It syncs to Google Drive too, so you can access them from the cloud on any device. Keep is supported by your Google account so it’s easy to add notes to your docs, spreadsheets, etc. Many organizations are choosing Google Drive over MS Office for a lot of their tasks, and Keep can keep you integrated with Google. That’s the real power of Keep. Often, tasks need to be completed in different places and it gives you the ability to do check in on what needs doing, wherever you might be. Like a lot of multi-use apps, it takes some getting used to, but your note taking will be more productive once you get the hang of it. Once you fire up Simplenote, you'll notice one thing: there isn't much going on. That's because this app is super lightweight, both in terms of size (4.5 MB) and resource-demanding functionality. You simply type in notes, add tags if you like and hit the share button if you feel so inclined. You can also create a Simplenote account. Once you punch in an email address and password you'll be able to back up notes, work with them on the web and sync across different devices. Other cool features include setting up a secure PIN lock and switching between a dark or light theme (dark is reminiscent of Android 4.0). Where Simplenote differs from other Android note apps is that it isn't concerned so much with keeping organized, or staying busy, but rather with offering a home for all your ideas and e-scribbles. Simplicity, as the name implies, is Simplenote's strength. It functions similarly to Google Keep but has a cleaner interface and loads faster. Monospace is a new (still in beta) minimalist-designed note taking app that's about as simple as it gets. If you want a note taking app with no bells and whistles then this is the ticket. Its interface reminds me of 90's Windows file folders with modern Android functions. Creating a new note in Monospace is like any other note taking app. You just click on the button in the lower-right hand corner and a new note will pop up. You can either choose a folder or have Monospace automatically choose it. Once you're finished it records the time plus the word count. You can then export it or put it into a folder. All folders are viewed from the home screen of the app. It has Google Drive Sync capabilities but you need a Pro account, which costs around $5. You can have your notes automatically shared between the Monospace app and your Google Drive. Unless you really need to sync with Google Drive there really is no reason to buy a Pro account. The other Pro features are uninspiring. What do you use Android note taking apps for? Which note taking app do you think is the best? I use OneNote, very intuitive and easy to use. However, Boostnote was easier to use, so I switched. This quality is amazing for free. Give ShareNŌTZ a try. It offers notes, lists, reminders, as well as real-time collaboration and sharing of notebooks with friends and colleagues. I am using SteloNote because I love its unique design and functionality. This is a new app but you will find that it has advance features that no other apps have. I think the problem with choosing note-taking apps is that so many of them converge on the same functions. It's like console wars if they played the same range of games - more than they already do. (Or did. I ended my tour in the console wars some time ago) You can draw and handwrite in Squid? Well you can do that in Onenote! You can write down ideas in Onenote? Well you can do that with Simplenote! You can sync across devices with Simplenote? Well you can do that with Evernote! And so on. That's maybe a bit too simplified, but besides whether your business flies the flag for Microsoft or Google, I'd hazard a lot of the choice comes down to how complicated you want it to be (not exactly the same as what function you want it to perform. Close, but not exact.) and whether you like the pretty colours or not. I use Onenote, by the way. Oooh, purple. I like Google keep ,its nice and simple and looks good and does the job and its completely free! My Notes is the best by a mile. A pleasure to use. I find the others a chore. Evernote all the way! Big fan of the Elephant here. I have used colornote and Evernote and like what each has to offer. With that said, I am slowly moving away from Evernote due to its complexity and that for it to work properly requires a connection. When I travel I work offline and although there's Internet connectivity on many airlines I have found them to work mediocre at best. So I prefer to work offline and have my data on my device which colornote allows me to do. But I'll have to check out some of the others in this article. I used to use EVernote, however for my wants and needs it would require that I sign up to a price plan. I love the way they help you in the Web, but for the price???? I'm extremely forgetful! Google Keep is my saviour, it's easy to list tasks or shopping lists, add photos. I tried Evernote but don't like the UI or the need for subscription. It is bit too much. a wiki? Didn't think it could be done. How can u do it? I use Google keep, it's simple and easy to use. and I am use Google keep on my pc it's really good. :) Do you still use ColorNote? Not as much as I used to no. Omni notes. Free and open source. I use NoteSync….. Works perfect with Google. I Use Google Keep, it's simple and easy to use. I tend to use the list notes as I'm quite forgetful, it's easy to add a new task or reminder. Only major downside is its not integrated into Google Now. I totally agree with the above articles and comments, however I can't understand why Wunderlist hasn't got a mention. I use, or have used, everything on the list but have to say I find the features on Wunderlist intuitive and use it throughout the day, every day. Even have shared folders from different account users all available, fast, secure and across multi platforms. It gets a 10/10 from me. Give it a try. Thank you for your comment. I agree, Wunderlist is an excellent app. Have you upgraded your account or do you use the free edition now? Would you recommend upgrading? Evernote Webclipper is a very handy browser add on for Evernote.